We have sold thousands of Windsor Road bikes. A high level of engineering and attention to detail is seen on all Windsor road bikes. Happy customers send friends and family to buy these incredibly capable road bikes all the time. "… Great looking bike. Great for bike paths and regular riding." "... got my (Windsor Road Bike) this week. The frame is sweet." "…I'm almost at the 800 mile mark and haven't had any problems yet. IMO its a great bike for the price." "...The bike is fast. On a recent ride I was able to sustain over 20mph for a good while (I am 51 years old so 20 mph is okay in my book)." Even when reviewed at list price, experienced riders feel the Windsor road bikes are incredible values. When you consider the discount BIKESDIRECT offers on these incredible quality road bikes; nothing else comes even close! 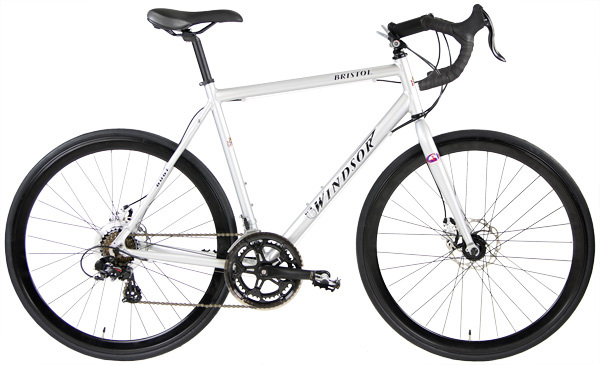 The new Windsor Bristol 1.0 is just the road bike for the rider wanting the performance and lightweight of an aluminum frame, coupled with the comfort and reliable performance of a CRMo fork and dealing with a budget. Plus, powerful disc brakes give confidence in a wider range of conditions than regular rim brakes. Fast Aero Aluminum rims round out this well equipped disc brake road bike. Compare this bike to the Trek or Giant Disc Brake equipped Road bikes around $800 plus tax. Both bikes may have the same number of gears - Shimano parts and aluminum frames. Trek Road Bikes with similar specs maybe more. Be aware, other brands will use non-Shimano parts on the drivetrain. Why do you think they do that? More Shimano parts in your drivetrain are designed to work together for optimum performance and give smoothest shifting and reliability. We apologize in advance if we over-sell your size as quantities are very limited. 47cm fits most cyclist 5' to 5'2"
50cm fits most cyclist 5'3" to 5'5"
53cm fits most cyclist 5'6" to 5'8"
56cm fits most cyclist 5'9" to 5'11"
59cm fits most cyclist 6' to 6'2"
62cm fits most cyclist 6'2" to 6'4"
Stem Aluminum alloy Quill EXT:90MM(47~50CM)/110MM(53~56CM)/130MM(59~62CM)x0 DEGREES, ALLOY S.B.